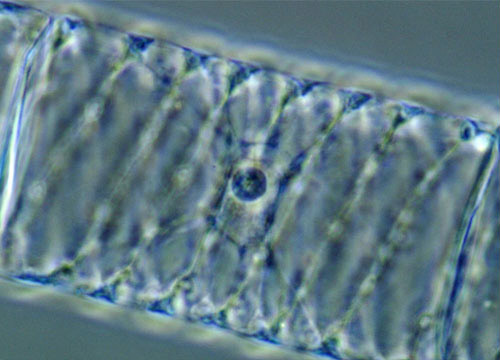 The filamentous algae genus Spirogyra owes its name to the characteristic spiral shape of the chloroplasts possessed by its members. Sometimes alternatively known as water-silk, mermaid's tresses, or pond scum, a large presence of the unbranched algae often indicates the nutrient enrichment of freshwater bodies. 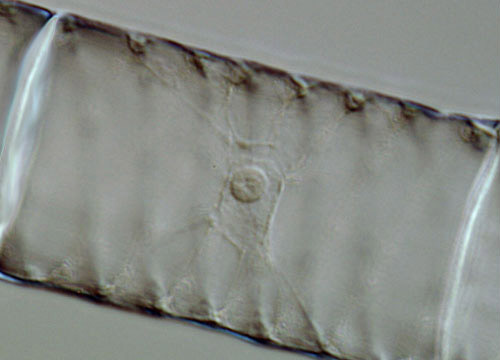 More than 400 species of Spirogyra have currently been catalogued, all of which can be differentiated by the spores they produce during sexual reproduction. Spirogyra usually reproduce via vegetative means, individual filaments fragmenting to form new algal strands. However, during periods of poor environmental conditions, Spirogyra may switch to a sexual means of proliferation. Adjacent filaments are capable of extending conjugation tubes toward each other in order to exchange genetic material and produce a zygospore, which is protected by a thick cellular wall that enables it to survive in sediment until more favorable conditions emerge. On sunny days, mats of tangled Spirogyra usually float on the surface of the water, kept afloat by tiny bubbles of oxygen created through photosynthesis. The algal mats sink when the sun goes down and the process reverses as the level of photosynthesis diminishes. Subsequently, the algal strands consume oxygen for cellular respiration and produce carbon dioxide as a waste product. In highly fertile areas, thick algal mats may cause large fluctuations in the dissolved carbon dioxide and oxygen content of the water body. The resulting changes in the water's pH can occur rapidly, leading to stress and even death of other organisms present in the environment.